What argumentation elements do you want to emphasize in the lesson? What are the needs of your students? What are the opportunities in existing curriculum for having students engage in argumentation? What kind of evidence is available, and how can you make it accessible to students? 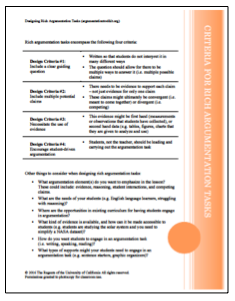 How do you want students to engage in an argumentation task? What types of supports might your students need?